There has been so much press recently on Korean beauty and skincare (I think I saw Vogue tweeting their article at least once every 30 minutes at one point, and rightly so!) yet it still feels like something we in the UK and as beauty bloggers haven’t caught onto yet. South Korea and America have long advocated the traditional practises of skincare and requirements for beauty that works yet is attainable, and I for one love it. I love the whole system to layering products, I love the innovation behind the brands, and I also love Korean beauty bloggers – these girls seriously know their stuff and really go all out on a review, it’s brilliant and refreshing to see. Since q-depot got in contact with me a few months ago, I’ve spent weeks researching Korean beauty; the brands, the products, the bloggers, how and why these brands work and what Korea as a culture expects from beauty. 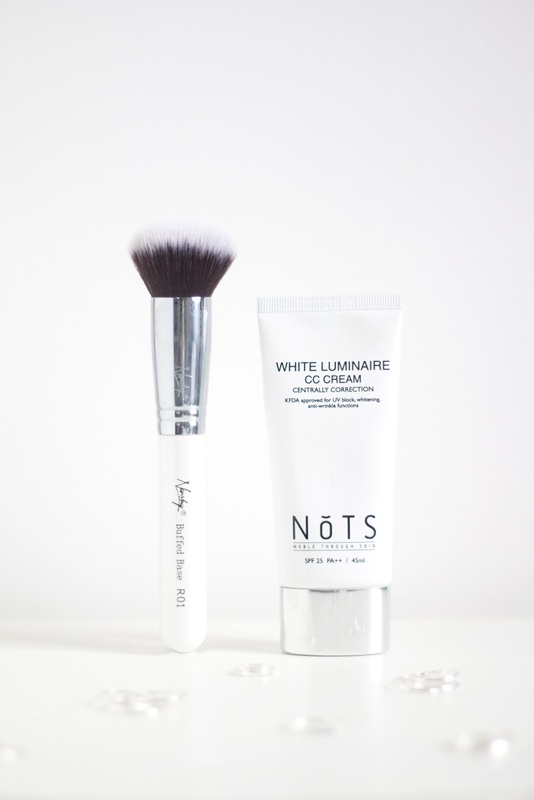 Currently I’m planning a huge Korean beauty haul to share and report on (because if you get this excited over skincare you need to share it), but for now, I’m going to tease you with this beauty – NoTs White Luminaire CC Cream*. This whole BB, CC, DD cream culture started in Korean however the true power behind the product has lost meaning since arriving on our side of the world. Blemish balms and correction formulas are designed to withstand humidity, to cover acne, to provide very high SPF without giving off too much of a whitened appearance, and to also perfect the skin without feeling cakey. CC creams are one of my favourite products as usually they offer a nice bit of coverage without feeling too much on the skin, but boy does NoTs take it up a step – SPF 25 with PA++, this CC cream truly tailors to every skin-tone thanks to amazing centrally correcting pigments inside and it lasts a lonnnng time; one layer for me lasts all day without feeling like it’s sitting on my skin, two gives around 7 hours decent wear on me before it starts to feel a bit ‘hmmm we’re pushing the oil limits here’. I’m more than happy to sit around the house in this for some coverage, I’m even happier going out into town wearing just this without concealer because the coverage is THAT good, and it really adds life into your skin thanks to it’s whitening properties. As I said, since trying this out, I’ve been hitting q-depot daily to research into the brands they stock – there’s loads of cruelty free brands available including Lainage and Etude House (my faves), plus there’s free shipping over $69 or a flat rate of $2.99 for anything under that which is pretty awesome considering there are thousands of products to choose from (and as well as being cruelty free, they donate 3% of their profits to good causes – beauty without cruelty is real and I’m loving it). So why should you try Korean beauty? Because it really works, it delivers on any expectations and it makes the gap between skincare and beauty much easier to work with. I’m big into caring for my skin (and layering loads of products on at once) so I’m totally enthralled by the care Koreans put into their routines and brands, and if you want a CC cream, blush or even a face mask that is going to make your skin look and feel gooood, well, it can only be Korean. Have you tried Korean beauty before? Are you a fan of CC creams? Will you be checking out q-depot?